Poor Apple. Hours after it announced a much-awaited smaller iPad (plus a sexier, thinner iMac), Wall Street pushed its stock down 3%, perhaps disenchanted at the relatively high iPad Mini price of $329. 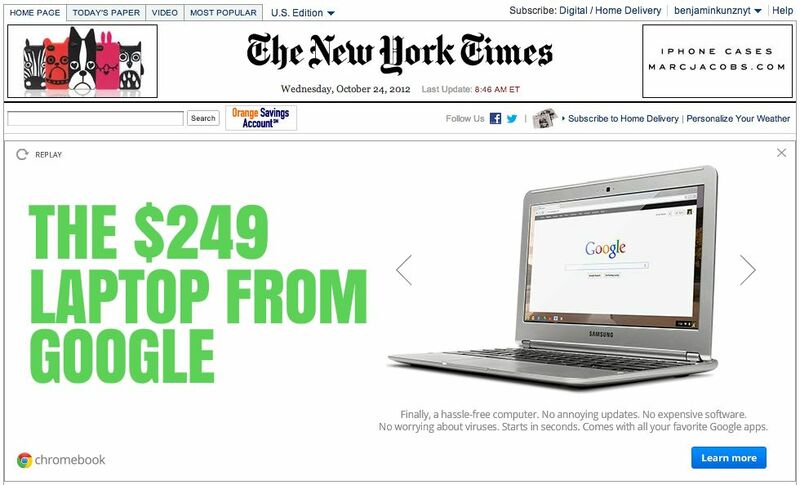 And now, a day later, Google is pushing ads for a radically new, svelte laptop that costs — gulp! — only $249. Google’s machine is a thing of beauty because — while perhaps not hinged aluminum that feels like an alien space probe in the hand — it works on cloud-based Google software, with nearly unlimited storage online, no need to backup files, and no worries about pesky viruses. It’s an advance over the prior Google Chromebook, which was clunkier and initially cost $499. It’s perhaps the perfect inexpensive gadget to give a 12-year-old for homework. And of course, it ties users into the Google content-and-search ecosystem. The cost of keyboards, glass screens and computer chips is falling so rapidly that soon marketers may give devices away as incentives to spend more time with their messages. Oh, wait. Google just did. It’ll be interesting to see how it plays out. I’m not sure that price point and cloud benefits are enough to cut it for the average to heavy user. Take those who have made the leap from PC to Mac and have tried to get by without a copy of MS Office as an example. It works for awhile, but there comes a point when you need to track changes, add a pivot table *gasp* or do something that The Goog just doesn’t yet support. I’ve recently been trying to challenge myself to do the same and see if I can get by without Photoshop by using tools like Pixlr. You can, to a point… So if expectations of output are reduced and consensus is toward Google Docs as the new standard, this effort stands a chance. Until then, I think that most are still willing to pay up for additional capabilities and the option to add them in the future if necessary—whether or not they actually do. Google would be wise to seed these in the market and provide many opportunities for trial. Low price alone isn’t going to be enough to get most to pop out a credit card and take such a risk.